We had an awesome day yesterday, despite the five hours of sleep we got that was actually broken into two segments - the airplane ride and Ryan's comfy guest bed. Peyton, waking up David! He was like a kid at Christmas, waiting outside our door until I opened it up! After waking up the 2nd time and having some breakfast, we headed off to the CNN building. It was so cool touring CNN and meeting all of Ryan's awesome co-workers! * We got to watch Hala rehearse for her new show (shameless plug here, but "International Desk with Hala G." airs from 12p-1p eastern, on CNN International) and see a lot of the behind-the-scenes action that goes on in the control room. I seriously don't know how my brother does it, because I thought being in a room with 25 screaming children was enough to get my BP up, but the control room is 100x more chaotic. We left CNN (yummm, and grabbed some Jimmy John's for lunch) and drove around a little bit of Atlanta before picking up Hala for Cirque Du Soleil. OH MY GOSH! I cannot go on enough about how INCREDIBLE the show was. We had tickets to Kooza which tells the story of an innocent clown finding his place in the world. I really didn't know what to expect, except for the idea that there was going to be A LOT of crazy stuff going on. In my wildest dreams, I couldn't have pictured some of the things we saw. We were 5 rows back from the center of the stage (but, honestly, I don't think there is a bad seat in the tent). The cast had amazing costumes and make-up and the performances were just mind-blowing. There were clowns (not as scary as I had imagined, either), jugglers, acrobats, a chair balancing act, a unicyclist who cycles around stage while twisting a woman around on his shoulders, tight rope walkers, and contortionists! My personal favorite was the two performers in the Wheel of Death. The entire show was amazing and I could go back and see it again....and again! The four of us after the show. *A special thanks to Ryan's co-worker, Armie. She not only reads this blog AND called me adorable, but also gave us a bag full of baby goodies! Thanks Armie! I am so glad you all are having a good time, and to be truthful I am a bit jealous not to be able to experience it all with you. BTW I really like how the nursery is coming along. That's so funny. I was JUST there working at Copelands's Cheesecake Bistro next to where the Cirque Du Soliel tents are set up! I love Atlanta. It is a really fun city. Have a great time. 1) Jimmy John's is the best sandwich shop ever- when Subway goes to sleep at night, it dreams of being as wonderful as JJ's. 2) Ryan's dog is so adorable. 3) CDS sounded amazing, I really want to see Love but since Vegas is kind of far, maybe we'll go check out Kooza when it's in Baltimore next month!!! 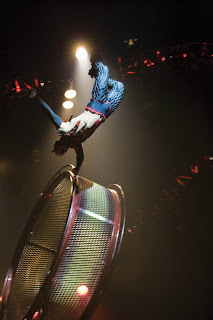 I have never been disappointed with any Cirque Du Soliel show...they are amazing. I have not seen this one though. It would be such fun to watch. I don't know how some of the people can bend the way they do!